Wow.. 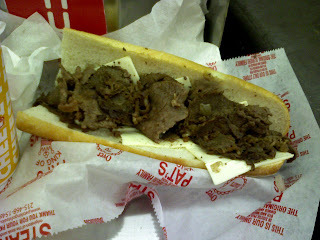 I've never been to Pat's before (from the West Coast) but of course everyone who watches Foodie shows knows all about the big rival between the two cheesesteak joints in Philadelphia. To actually see that photo you have (the second one where the cheese looks cold) is just... zow.. :-O ...I'll bet anything you can make one ten times better! I thought about doing that recently. I had some thinly sliced ribeye, top round, and a small amount of filet. I did the cheese just right...I place the mix of meat, and onions in 3 even piles enough to fit on the roll. I place the cheese on the piles and let them melt. Then I grab each offering with the slotted spatula and start piling it in. Nice balance with cheese running inside the sandwich. Not like this debauchery that I received from Pat's, which was a few slices of lukewarm slivers and unmelted cheese. Pat's does have amazing rolls and I've enjoyed them in the distant past. Not so much anymore, as the poor execution makes me want to go elsewhere. They're living on reputation only at this point. They put the cheese slices on the bread separately instead of on the grill in deference to kosher Jewish customers who can't mix meat and dairy. I prefer the Whiz steaks at Pat's. Provolone isn't bad if you get it wrapped to go. By the time you eat it the cheese is melted. That's the first I've heard that they did it to remain kosher. Seems like it would be easier to have a section of the grill, or a seperate pan for kosher sandwiches. I've never been much of a fan of whiz on the sandwich. It overtakes the flavor. I'm not really partial to provolone on a steak sandwich. I love it on just about everything else but American is my choice(and my baseline for rating). With all that being said, The "King of Steaks" can't compete with many, many other establishments that have figured out how to nicely melt cheese on the steak.